Our laments are joined and enabled by the Holy Spirit who translates our groans and despair. We live in the frustration of waiting – for change, for healing. Mental illness is all too often characterised by waiting – for help, medication, treatment, hope. The good news is that the christian hope is not just wishful thinking – we are joined in the wait by the Holy Spirit who was sent to give us a foretaste of the hope we will one day enjoy in full, who translates our wordless groans into prayer. Our laments are not new cries, they are echoes of the suffering of Jesus, enabled by the spirit so that when we experience a shadow of the darkness Jesus descended into, but not without hope. 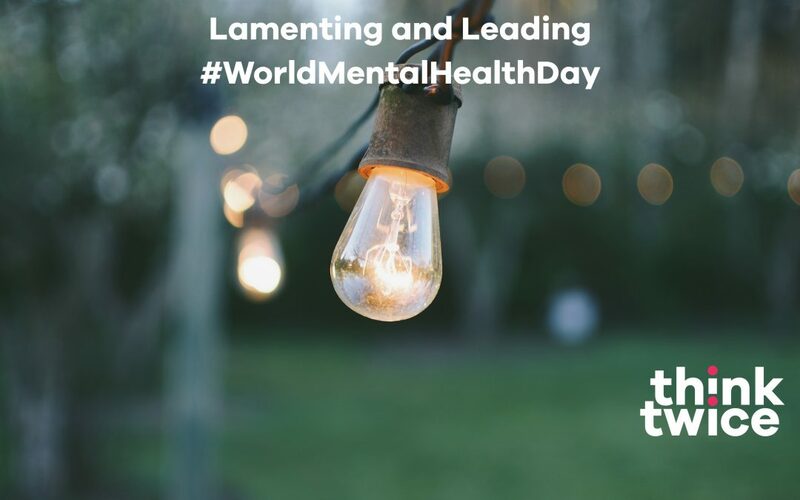 World Mental Health day can be a day of lament – but it’s also a day for the church to lead the way. “Britain’s universities, hospitals and schools bear testament to almost forgotten eras when Christian churches innovated social solutions to the pressing issues of the day. Wilberforce, an MP in the 18th and 19th centuries, used the idea of Christian equality before God to argue for the emancipation of slaves… The church has powerful social assets that the government can no longer afford: it is present in every town, its people are motivated, local and engaged, it has buildings, services and expertise and its faithful are commanded to “love thy neighbour”. Our churches need to become sanctuaries for those struggling with mental health issues; not apart from our worship, but as a part of our worship. We can lead the way in increasing understanding of mental illness, because our Bible is full of every spectrum of emotion and they are all laid at the foot of the cross and we can collaborate with modern psychiatry and mental health care to provide care and relief. It is great news today that the Prime Minister has appointed a minister for Suicide Prevention and pledged money to ensure the continuation of the Samaritan’s great work – how can we see the gaps in care and not get involved!? The conversation about mental health in our churches is one that needs to continue so that the church can lead the way in seeing an end of the stigma of mental health in our churches, our communities and our country. We can’t wait to take up the challenge. Soon to launch a whole new resource, a weekly drop in space where anyone can tell their story, and find a listening ear, all in confidence. Just needing more volunteers and we’re ready to go !